Virtuoso timpanist Jonathan Haas, celebrated for raising the status of the timpani to that of a solo instrument, performs internationally and teaches at NYU, Juilliard and the Aspen Music School. From classical concertos to jazz and rock n' roll, from symphonic masterpieces to the most experimental compositions, he has championed music for his instrument. Haas' successful efforts to expand the timpani repertoire have led him to commission and premiere more than 25 works. He's garnered worldwide attention for his performances of Philip Glass' Concerto Fantasy for Two Timpanists and Orchestra, which was written for him. A recent Los Angeles Times profile when he played the Glass work with the Pasadena Symphony last October called him "the world's foremost solo timpanist and a passionate flag-bearer for the timpani's solo potential." In early December, he was the subject of a feature on "Weekend America," the national American Public Media radio show, on which he said, "What I'm drawn to, in percussion in general, but timpani specifically, I love low frequencies. When I would I go to rock concerts, or sometimes, I'd be in them myself, it was that pounding bass in the bass drum. They're visceral. You can feel them. They shake a room, they shake your body. It's a real feel good frequency. And that's why I enjoy playing the timpani, because we're way down at the bottom." 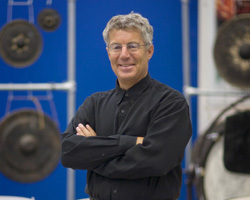 Also this winter, he led and performed in two New York percussion concerts featuring his Juilliard and NYU students, both featuring exceptionally novel programs, including several world premieres along with works by composers ranging from David Byrne and Frank Zappa to Shostakovich and Stravinsky. Haas' 2008 schedule includes two quintessential examples of his maverick approach to his career as a performer and teacher. On June 1 to 5, he leads the second NYU Broadway Percussion Seminar, an event he created last year. This intensive study and performance workshop for young professionals and high school and college percussionists features guest percussionists from The Lion King, The Little Mermaid, Young Frankenstein, Wicked, Spamalot, Grease, the New York City Ballet and NYC Recording Studios. Also in June, Haas hosts, produces and conducts "Frank Zappa/Edgard Varese," a six-day (June 8 – 14) intensive performance seminar, examining in-depth the music of iconoclastic composers Frank Zappa and Edgard Varese. Gail Zappa also participates in seminars and round table discussions concerning her late husband's music and career. Among the works studied and performed are Frank Zappa's legendary The Adventures of Greggery Peccary and the world premiere of his Revised Music for Marimba and Low Budget Orchestra.